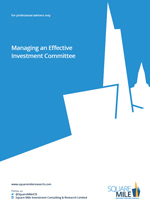 The purpose of an investment committee is to oversee the group investment strategy from a number of perspectives and to ensure that the best interests of both the business and its clients are at the core of all investment activity. This might range from the selection of suitable attitude to risk and stochastic modelling tools to strategic and tactical asset allocation and fund selection. For many groups, the de-risking and operational efficiency of Centralised Investment Proposition has brought a new perspective in the regular oversight of third party or sub-advised services. Square Mile is an independent investment research business that works in partnership with regulated professional financial services firms. We help advisers to develop informed investment recommendations so that, with their support, their clients can make the decisions that are right for them. Focusing first and foremost on in-depth, qualitative fund research, we provide tailored support and investment services for financial advisers and institutions. For us there is only one way to deliver rigorous and insightful qualitative research and that is to invest in professional, qualified and experienced people. For this reason alone we have built one of the strongest and most respected qualitative investment research teams in the UK. Our analysts focus on investment research and meet regularly with fund managers to understand how those managers work, how they think and how they react to markets. We listen, we observe, we test, we challenge, we discuss, we deliberate and we form opinions. Finally, we publish our research and our views. These are based on clearly articulated outcomes and objectives, from which adviser firms can identify suitable funds to meet the needs of their clients.